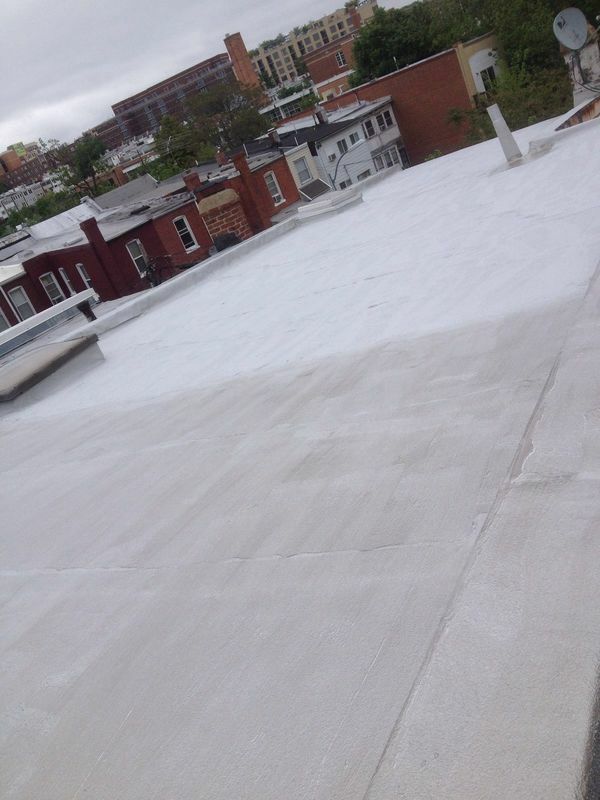 Boyd Construction Co Inc, has been reconditioning roofs since 1932 in the greater Washington DC area. 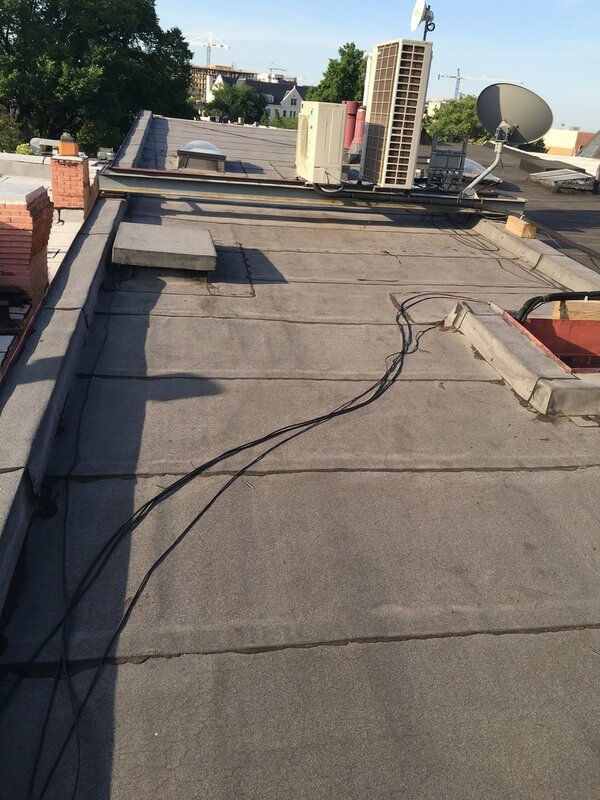 They are competent in all forms of reconditioning, specializing in flat roofs that are prevalent and can be seen throughout the DC area. Flat metal roofs are defenseless from an array elemental and environmental effects, for example; rust, moisture stains and discoloration due to harsh sunlight. Cleaning the roof with a biodegradable cleaner and a stiff-bristle broom is a great beginning but it does NOT eliminate rust or help with discoloration. Reconditioning the roof by doing some minor patching and applying a coat of elastomeric paint can lengthen the longevity of the metal roof and enhance the look. Before you begin, recruit a contractor to inspect the roof and repair any damages. Position an extension ladder at the edge of the roof. Extend the ladder so the uppermost rung is at least 3 feet above the edge of the roof. 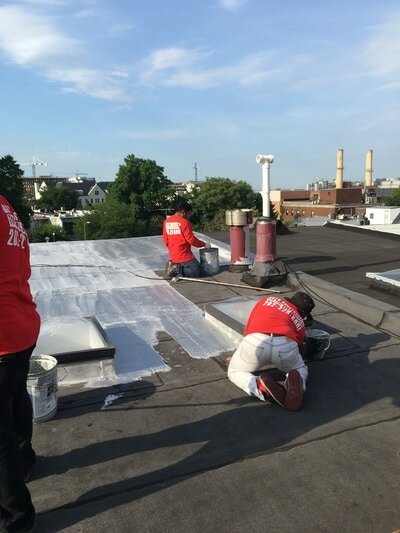 Carry a container of urethane roof cement and a 2-inch wide plastic putty knife onto the roof. Inspect the surface of the roof. Apply a uniform layer of the cement on the heads of rusted fasteners, rust spots and around the upper edges of metal flashing where pipes and vents go through the roof using the putty knife. Allow the cement to cure for one hour. Stage a 5-gallon bucket of elastomeric roof coating near the corner of the roof that's farthest from the ladder. Set up a paint roller with a medium-nap roller pad and attach the roller to a paint pole or broom handle. 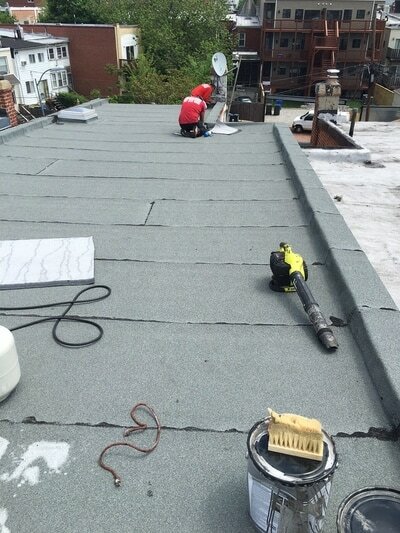 Dip the roller in the bucket of coating and begin rolling a 3-foot square section of the roof. 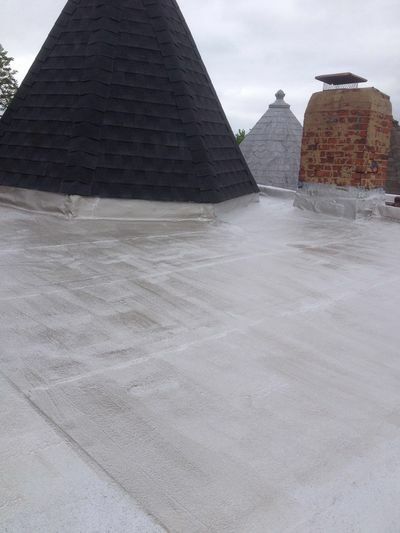 Blend the coating for a uniform application as you work toward the edges of the roof. Move the bucket several feet and coat another 3-foot section, blending the coating to a uniform application. Continue to move the bucket and apply the coating until you reach the edge of the roof where the ladder is in position. Tie one end of a 1/4-inch rope that's long enough to reach the ground around the handle of the bucket and stage the bucket near the ladder. Coat the final portion of the roof each way of the ladder, leaving a small area to access the ladder. Dip the roller in the coating and use the rope to lower the bucket to the ground. Roll the final section and descend the ladder. Allow the coating to cure overnight. Access the roof using the ladder. Patch any spots of rust that show through the coating with the urethane cement and the putty knife. Allow the cement to cure for one hour and re-coat the patched areas with elastomeric paint and a paint brush. Purchase the amount of roof coating needed based on the size of the roof and the amount of coverage as given by the manufacturer. Typically, 1 gallon covers approximately 100 square feet. Select the elastomeric coating in a color or tone that suits your preference.